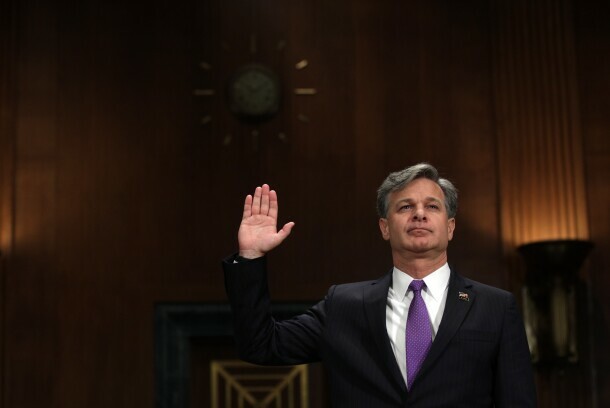 Christopher Wray is sworn in during his confirmation hearing before the Senate Judiciary Committee July 12, 2017 on Capitol Hill in Washington. Law firm partnerships fiercely guard against disclosing what they pay their principals. But when partners go into the government, federal financial disclosures help reveal some of the best kept secrets in the legal industry. Law firms are private entities, allowing them to keep compensation figures under wraps. Firms are sensitive to revealing salaries and other compensation figures largely due to privacy concerns, but they also don’t want to be seen as gouging clients. “There’s a feeling in firms that we don’t want to rub our clients’ noses in the fact that some lawyers make more than decision makers at some companies,” said Kent Zimmermann, a legal industry consultant with Zeughauser Group. Top partners at major law firms can earn between $3 million to $10 million, according to compensation experts, while even career government lawyers with long service records rarely make more than $250,000. Lawyers, however, disclose compensation when opting for a government appointment. Attorneys typically must show partnership income and a list of their clients. A look at nearly two dozen partners, mostly from the biggest law firms, who joined the Trump administration since last year, found many drew high six-figure and low seven-figure annual compensation, along with retirement benefits, when they left their law partnerships. Some, like FBI Director Christopher Wray and Robert Khuzami, a deputy attorney general in the Southern District of New York, earned much more. Most recently, Dan M. Berkovitz, a partner at Wilmer Cutler Pickering Hale and Door, listed $1.18 million in partnership income for 2017 and a few months of 2018. Berkovitz, a former general counsel for the Commodity Futures Trading Commission during the Obama years, was recently appointed one of the agency’s commissioners. Federal financial disclosure aims to identify any potential conflicts with past clients that require recusal. But it’s not just moves into the government where disclosures can tell an interesting story. Disclosures like Berkovitz’s also underscore the value a government job can have on an attorney’s earning power once back in the private sector. He joined Wilmer in 2013 after his general counsel stint. “The information on such forms can be a useful benchmark for determining the extent to which attorneys transitioning from the public to the private sector can expect to be compensated for the added value they’re bringing to the table,” said Jack Zaremski, a New York-based legal recruiter who helps government attorneys find law firm jobs. Khuzami also created waves a few months ago when he disclosed $11.1 million in partnership income over about a year’s period. He was a partner in Kirkland & Ellis’s white-collar practice after heading up enforcement at the Securities and Exchange Commission from 2009 to 2013. And Wray reported $6.3 million in income from King & Spalding where he was a partner in the firm’s special matters and government investigation practice. His disclosure documents indicated he also expected to receive a partner payout of $9.2 million. He had been a partner in the firm’s Washington office for 12 years prior to his appointment. Partner payouts like Wray’s are based on partnership shares that are accumulated over long periods of time and would be calculated using a variety of factors, including credit for legal matters brought to the firm. Such credits are rarely made public. In addition to compensation, government ethics forms also provide a look at the clients of newly nominated government lawyers. That list can be checked for potential conflicts of interest between private legal work and government work. Under federal ethics rules, the lawyers may not participate in matters involving former clients for at least one year. In Berkovitz’s case, there were about 18 client companies listed, mostly large financial institutions such as JP Morgan Chase & Co, Morgan Stanley, UBS Financial Services Inc. and Citigroup Inc.
Another Wilmer attorney, Jeffrey Kessler, who recently took an enforcement and compliance job at the Commerce Department, listed major tech companies such as Google Inc., Apple Inc., Oracle Corp. and Facebook Inc. as among the nearly 30 companies for whom he provided services in 2016. His government responsibilities include unfair trade practices. A review of a number of other disclosures shows that there can be a substantial variation in what private firm lawyers earn. Steven G. Bradbury, a litigation partner at Dechert LLP in Washington, reported earning $1.15 million from the firm over a 17-month period, between January 2016 and May 2017. He was named last year as general counsel for the Transportation Department. Jason Klitenic, a former Holland & Knight partner, reported his income was $828,483 in 2017 after he was nominated to the post of general counsel for the Office of the Director of National Intelligence. Another Wilmer attorney selected for a top government job was Gail Ennis, a former securities litigation partner, who was named inspector general at the Social Security Administration. Last October, she reported earning $2 million in partnership income from the beginning of 2016, according other disclosure forms. Kessler, who was a firm counsel for regulatory and government affairs at Wilmer, reported that he made just under $682,000 for 2016 and part of 2017. He took an enforcement and compliance job at the Commerce Department. Sometimes the disclosures can yield interesting twists, including that of Charles A. Rettig, a Beverly Hills, Calif., lawyer. In the run-up to becoming IRS commissioner, he reported a $1.13 million salary from his former firm, Hochman Salkin Rettig Toscher & Perez. The amount, it turns out, included some annual income from the estates of Michael Jackson and a former wife of Marlon Brando.